Luca Bassani, the ebullient founder and president of Wally, is fond of explaining how there is no need to persuade someone to buy one of his boats. Wally owners, he contends, are born to the purity of the brand. 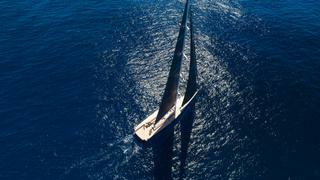 The owner of Barong D is one of an elite trio for whom that applies more than most; each of the three is now on their third successive Wally sailing yacht. The third yacht to carry the Barong name was launched in June 2016 as the faster, more spacious and modern successor to the Wally 94 Barong C, which the owner launched in 2005, and 2000’s Barong B. 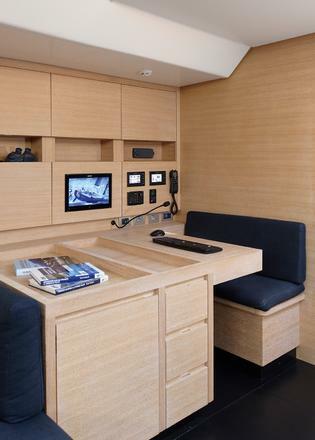 Discreet and discerning, the owner is a lifetime sailor who inked two fundamental requirements indelibly at the top of the brief for the new boat: speed and simplicity. 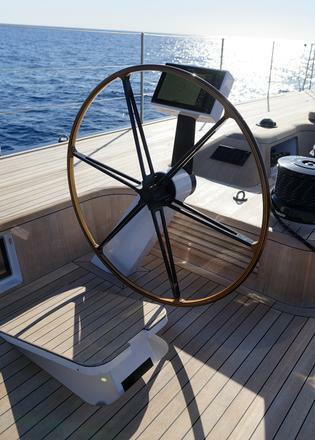 The opening brief to Wally and Frers Naval Architecture & Engineering — designer of the preceding Barongs — was for a fast cruising yacht with a real, optimal range of five to 30 knots. But she is not barren inside — after a distinguished racing career, the owner yielded to the urges of father time, recalibrating his competitive mindset with a desire to go fast cruising on Barong D.
With his wife, a noted artist whose pieces are on show through the boat, and usually one more couple as guests, they cruise three weeks on, 10 days off, for up to six months of the year. Hence the no-nonsense, down-to-earth, keep-everything-super-simple approach. They wanted her light because their preference is to sail effectively and enjoyably in five to seven knots of breeze. Not for them early morning motoring until a thermal breeze comes in, or idle hours at anchor awaiting the best of the wind. The beating heart of Barong D’s deck is the cockpit seating area. The owner still actively participates in sailing his yacht but when he is not enjoying wheel time, he and guests enjoy the sailing from here, in the thick of the action, in touch with everything that is going on. He is able to communicate with the captain or helm with a wink, a gesture or a few words, but braced and safe no matter the weather. One key measurement around which the cockpit dimensions were set is the length of the owner’s legs. The span from the cockpit table to the seat back wedge is exactly set to his requirements, so he is always comfortable and feels secure. Though deep and accommodating, the cockpit is flush with the deck horizon and in no way disturbs the view when relaxing or eating. 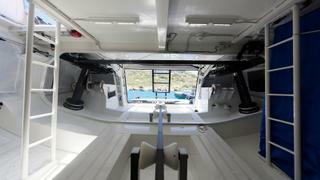 The same neat rigour has meant two pairs of chunky Harken winches to the rear sit below the line of the seating. The owner was truly fastidious in keeping the lines clean and pure — positive proof of his Wally DNA. 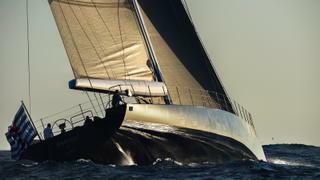 Built by Wally as its first venture at Solaris’s yard in Folari, Italy, construction was project managed by Wally’s redoubtable Lorenzo Mascarucci, who built the previous Barongs. In essence the new boat was to be Barong C, but bigger. It was to accommodate ten people maximum at the table with the same carbon fibre floors and simple panelling throughout. Options for floating chairs and tracks were rebuffed in favour of folding director’s style seats and matching tray tables. A long carbon bench is the signature centrepiece of the interior. In the pursuit of peace and quiet, the owner’s cabin was moved forward from the position it occupied in the middle of the boat on Barong C. The crew’s desire to have a second, aft entrance was met with a “no”, the owner saying he did not mind the disturbance. “He treats us like family. And for me it really does not feel like work. It is only ever ‘Let’s go sail’,” confirms Barong D’s captain. A particular emphasis was put on perfecting the weight and positioning of the interior and equipment in relation to the longitudinal centre of gravity, as well as limiting displacement with the lightest, strongest laminate using all pre-preg carbon fibre. 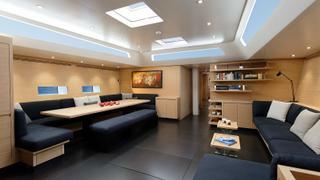 Bulkheads, floors, ceiling supports, and the furniture structure use pre-preg carbon and honeycomb cores. The 3D modelling also drew on a database of more than 30 Wallys. “That really gave us confidence in allocating the position of weights and their distribution to really know how they are affecting the centre of gravity and the stability and behaviour of the boat,” says Frers. 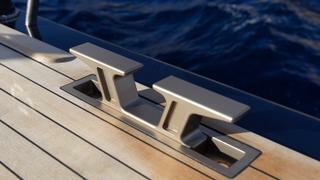 The deck was built over a 3D-machined mould, which presents a perfect surface and geometry. The huge expanse of teak on the deck, coamings, coachroof and cockpit is an artwork in itself, taking two master carpenters five months to finish. 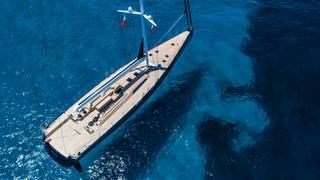 The result is outstanding, not only defining the signature look and organic feel of the superyacht, but also adding to the sensory experience as there is nothing quite like the smell of warm teak as the day cools. During the build every single item was weighed before it went on the boat. This pursuit of perfection yielded an all up weight of 65 tonnes, some two tonnes lighter than the original design weight. 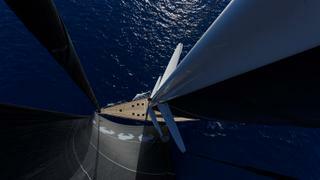 Wally says this is around 30 to 35 per cent lighter than a rival yacht. 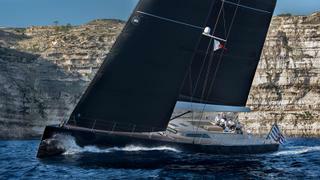 For broad LOA comparisons, the new Vitters Ribelle, at 32.6 metres, comes in at 86 tonnes while the Frers-designed Nautor's Swan 115 FD Shamanna measures just over 92 tonnes. Other significant weight saving is achieved using hydraulics technology. A higher pressure, 350 bar, allows pipe diameter and weight to be reduced. The higher pressure system also means a smaller hydraulic motor and rams can be fitted. The whole hydraulic system is controlled on a CAN bus network cable, thus reducing the amount of cabling, which is all ultra light and military grade. The interior, designed by Luca Bassani and Wally, owes a lot to the preceding Barongs. The simple, unadorned philosophy — light cherry teak panelling and carbon floors — serves to enhance the feeling of space in the main saloon. It is about form and function rather than flash or fashion. The main table to port seats 10 in comfort. Similarly a full-sized nav station makes no concessions. The owner’s suite forward houses two queen sized beds either side of the centreline, which convert to properly appointed and comfortable sea berths. 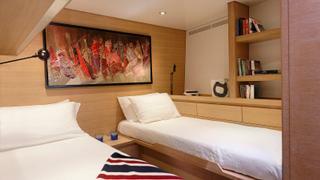 There are two guest cabins, one en suite with two beds and one with Pullman-style berths. The powerful Southern Spars hybrid modulus rig sets a generous easily controlled foretriangle, ensuring there is ample horsepower, acceleration and control in low winds. The self-tacking jib and mainsail are on magic trim sheet controls. The in-boom furling, meanwhile, is child’s play. A code zero and gennaker by North Sails are essential to the armoury. Both are on top down furlers, and the sails stay on deck most of the time, ready to be swapped as required. Running backstays were eventually retrofitted as the owner and captain sought a belt and braces peace of mind for when pushing Barong D in 30 knots or so of breeze. 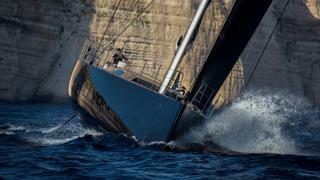 The owner’s demand was that each of his five crew be a fully contributing sailor in order to push the boat hard. Our day sail out from Valletta in Malta up to the acceleration zone between the main island and the high cliffs on Gozo’s south-west corner allowed useful insight into life on board Barong D. The upwind target is almost 11 knots and the twin rudders give a positive, light feel. The push-button winch technology ensures that the sail power can be trimmed with all the precision and intensity of hard racing, or you can let her pretty much sail herself. 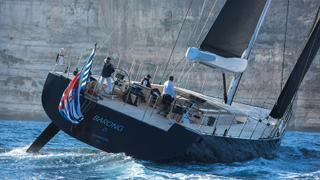 Under Code Zero or gennaker Barong D forges along in 14 to 16 knots of breeze making 13 to 15 knots effortlessly. She proves a dream to sail, as you’d expect from a boat born of long experience — both the owner’s and Wally’s. Named after Balinese mythology’s king of the spirits, a happy, bouncing, dancing symbol of good against evil, Barong D is very much an owner’s boat, the perfect synthesis of all the good things drawn from years of hard earned experience with her predecessors. And clearly none of the evils. First published in the October 2017 edition of Boat International.